Don’t skip prewriting. Painters know that the careful prep work of scraping, sanding, caulking, and priming makes the actual application of paint quick and effective. Writers have their own kind of prep work known as prewriting. Prewriting might include research, a formal outline, or conducting an interview. Some common prewriting activities include brainstorming, clustering and freewriting. However you do it, don’t rush this step. 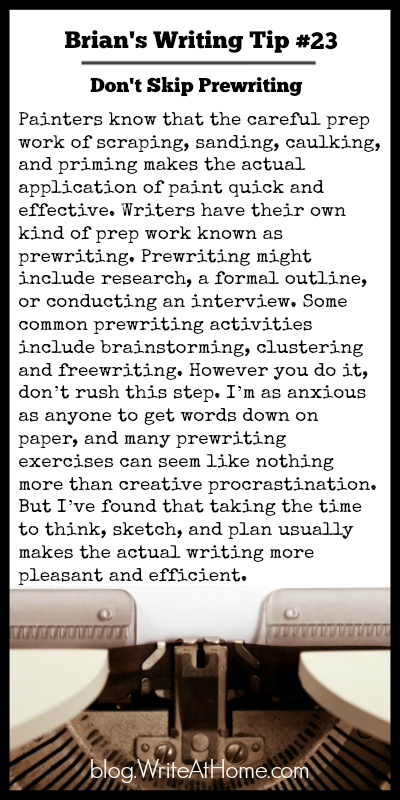 I’m as anxious as anyone to get words down on paper, and many prewriting exercises can seem like nothing more than creative procrastination. But I’ve found that taking the time to think, sketch, and plan usually makes the actual writing more pleasant and efficient.